The hot and humid village of Babahoyo, Ecuador lives in dread ever since many of its children started disappearing, to be found later, raped, killed and buried in several communal gravesites. The police have no clues but this gruesome story has become an obsession for Manolo Bonilla, a reporter for the Miami-based tabloid television show "Una Hora Con La Verdad", who has flown down with his crew to cover the story. Manolo is convinced that it is the work of a single serial killer, dubbed the "Monstruo de Babahoyo" by his show. 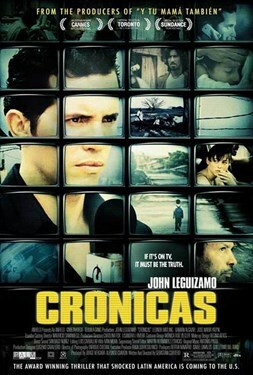 Tension in the town reaches a boiling point when Vinicio Cepeda, a traveling salesman, accidentally runs over a child, and an angry mob led by the child's father, Don Lucho, tries to burn him alive. Both Vinicio and Don Lucho are arrested. Manolo interviews both men inside a jail teeming with violence: Don Lucho has tried to kill Vinicio several times, so Vinicio is desperate to get out of there. Vinicio tells Manolo that he has information about the "Monstruo," but in exchange for it, he wants Manolo to do a story exposing his unfair and dangerous situation in jail. After checking out Vinico's information, Manolo immediately suspects that Vinicio could be the "Monstruo" himself, but doesn't tell the authorities; he'd rather use it to make a great story for the show. Meanwhile, his story on Vinicio's imprisonment takes on a dimension of its own, dwelling mostly on Vinicio's human side and the strength of forgiveness. When it's shown on TV, people's attitudes toward Vinicio change, including Don Lucho's, and the charges against Vinicio are dropped. When Vinicio is released from prison, Manolo finds hard evidence of Vinicio's guilt. Manolo and his crew are unable to find Vinicio, who was last seen heading into the wilderness with his adopted young son. Terrified of what might happen if he confesses, Manolo decides to leave the country at once. Before boarding the plane, the TV station calls to congratulate him: his story's made such an impact that he will be rewarded with his own show.